All those who appreciate beautiful books should give three cheers for The Folio Society, the sixty-four year old publishing enterprise which produces fine volumes of great literature at affordable prices. Founded in 1947 by Charles Ede, The Folio Society caters for bibliophiles who value books not just for their literary content but also for how they look and feel. Before the Society came along, handsomely bound books with fine illustrations were beyond the means of all but the wealthy. Ede had a vision to change that, to bring the pleasure of owning a library of superior publications within the scope of most people. He was assisted in this endeavour by two experienced figures in the world of book publishing, Alan Bott, founder of The Book Society and Pan Books, and Christopher Sandford of the Golden Cockerel Press. In 1947 three titles emerged from the fledgling enterprise – Tales from Tolstoy, Trilby by George du Maurier, and a translation of Aucassin and Nicolette, a thirteenth century love story by an unknown author. Today, there are over 300 titles to choose from, covering a wide range of subjects including history, biography, humour, fiction, travel, children’s literature, poetry, religion and philosophy. In the early days, Folio Society books came with dust jackets but since 1954 they have been presented in smart slip cases which help preserve the books. The attractive bindings come in a variety of materials including buckram, cloth, silk, goatskin and leather, with every volume designed to look stylish both outside and in. Indeed, one of the great joys of owning a collection of Folio Society books lies in appreciating the elegant spectacle they make on a bookcase. The standards remain impressive once you open a Folio Society volume. The books are printed on high quality, wood-and-acid-free paper which does not go brown and deteriorate with age, and is thus the only sensible choice for books that are intended to last for generations. Great care is also taken with the typography to ensure that reading a Folio book is a pleasurable experience, since nothing spoils the enjoyment of a book more than tightly packed or overly ornate type that swims before one’s eyes and causes headaches. Then there are the books’ illustrations – beautiful wood engravings, etchings, linocuts and lithographs that are usually specially commissioned by the Folio Society and executed by some of the leading artists of today. Just occasionally, high quality reproductions of famous, well-loved illustrations are used; after all, who could draw Alice better than John Tenniel or Winnie the Pooh better than E.H. Shepard? For budget conscious collectors, the beauty about Folio Society books is that there are several different ways in which they can be collected. First of all, there is the most orthodox method which involves responding to one of the Society’s many press advertisements. In return for a commitment to buy a minimum of four titles in a twelve month period, new members are allowed to purchase a specified book or set of books at a greatly reduced price. At the time of writing, for example, there are several enticing joining offers including The Complete Pictorial Guides by A. Wainwright for £19.95, a discount of 91% from the usual price of £219.85, and The Complete Paddington by Michael Bond, also for £19.95 instead of the usual £246.95. A postage and packing charge of £4.95 is added to these prices but even so they represent incredible value for money. In recent years a similar deal offered four superbly illustrated volumes of fairy tales and fables at a vastly discounted price, an offer many book lovers would have found hard to resist. There are other benefits of membership, too, including joining ‘gifts’ – usually an interesting book and a diary or a pen – and regular, highly informative newsletters. Yet however tempting these special offers may seem, there is a risk that people will think all Folio Society titles are as expensive as the ones that have had their prices slashed in order to attract new members. In reality this is very far from the truth. Relatively few cost more than £50 and in the current prospectus, around 113 of the 248 titles are priced at less than £30, very little more than the cost of any ordinary, mass-produced hardback. Many of the titles offered in this price range tend to be popular works of fiction. This makes fulfilling the four-book minimum order requirement easily achievable for most book lovers. Membership is made even more attractive by the occasional ‘buy one, get one free’ deals offered to members. A typical offer allows members to select one free book for each title they order, as long as it is of equal or lesser value. Great savings can be made in this way, enabling members to snap up titles from the prospectus that they had earmarked but had so far been unable to afford. 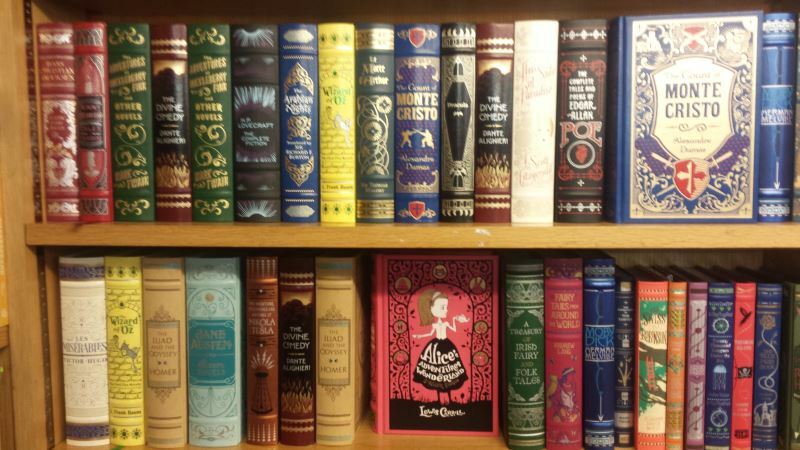 Although Folio Society membership offers many benefits, some people simply don’t like being obligated to purchase a minimum number of books and for them, the secondary market is the place to look. As a quick Google search reveals, plenty of second-hand book dealers sell Folio Society titles so then it’s simply a question of browsing through the dealers’ lists until something of interest is found. It’s a good idea to shop around because prices do vary from dealer to dealer, and postage and packing charges also fluctuate wildly. It is also an idea to browse internet auction sites as they are a good source for potential bargains. For example, a few years ago the Folio Society prospectus offered a lovely edition of the E. Nesbit children’s classic, The Railway Children, for £22.95 plus £4.95 for postage. At the same time, a copy of the same book was listed on Ebay with a ‘Buy It Now’ price of £8.99 plus £3.00 postage. That’s a saving of £15.91, which is not to be sneezed at. 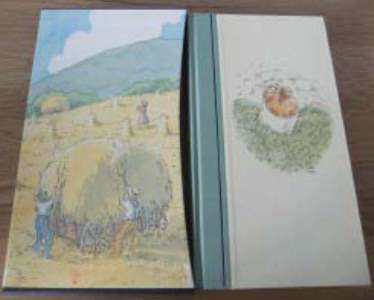 Examples like this are not unusual – there are currently over 2,400 Folio Society titles listed on www.ebay.co.uk and the majority of them offer good value. Set against these potential savings, however, is the fact that the books are secondhand and even though they may be in good or even unread condition, some people simply don’t like the idea of buying previously owned books. It would be entirely misleading to suggest that collecting Folio Society books is likely to make you rich. As has been demonstrated, many of the books don’t fetch a great deal on the secondary market and that seems to apply to the older volumes as well as those that are more recent. Of course, if somebody is desperate to own a particular title then they will pay whatever it takes to secure it. The Folio Society members’ magazine usually carries advertisements from dealers wanting to buy unwanted titles, so anyone with a collection to sell would be advised to start there. By and large, however, Folio Society books do not offer great money making opportunities. What they do offer is a solid investment in pleasure and really, there can be no better motive to collect than that. Shop around because prices can vary enormously If you like your books to be pristine, forget about buying secondhand and join The Folio Society instead For more information about The Folio Society, visit www.foliosociety.com.